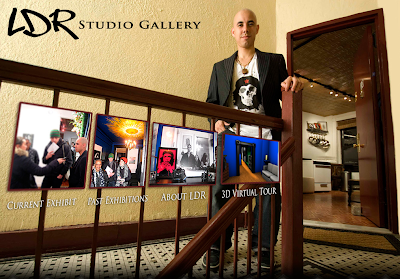 For more information related to the LDR Studio Gallery stop during the Bronx Culture Trolley Tour, please see the following press release and additional photos I included from a past evening showing. Besides being a model host, Luis D. Rosado has proven himself to be a leader in the art community brewing in the Port Morris section of the Bronx. I hope everyone can attend the show Luis and his host of artists are organizing. The event is a free to the public and a great way to see cutting edge art works right here in the BoogieDown. Bronx, NYC: Puerto Rican artist and curator Ali Irizarry and Luis D. Rosado, founder and director of LDR Studio Gallery in the SoBro area of the Bronx, join forces to present the exhibition VIEW: Vague Ideas of and Established World ~contemporary art by boricua artists~ in salute to the NYC Puerto Rican Day Parade 2011. Through this exhibition Irizarry and Rosado investigate how contemporary Puerto Rican artists are expressing their ideas of how the world and society are at this point of history, were all information from all over the world is accessible to the tips of our fingers. The exhibition will show the contrast of the different styles these artists are using to express themselves, and investigate their similarities and differences depending on where that artist was born and raised and where that artist is living at the moment. These are all Puerto Rican artists, with different lives, different souls, and different views of one established world. LDR Studio Gallery is one of the forces behind the rebirth of the emerging art scene in the South Bronx, and it is located at 137 Alexander Ave. #10, Bronx, NYC. As an independent art space it provide the artists a venue to educate, explore, and inspire their viewers. The Bronx Cultural Trolley will be visiting us, making stops on Wednesday, June 1st between 5:30pm-10:30pm and on Saturday, June 4th between 12:00pm-5:00pm. The Artists Reception will take place on Saturday, June 1st, 7:00pm-12:00am. We will also have a closing reception on Wednesday, July 6th, 5:30pm-10:30pm. The exhibition will run from June 1st to July 6th, 2011. For more information please visitwww.ldrstudiogallery.com. Take 6 train to 138th St./3rd Ave. and exit on 138th St. and Alexander Ave. Walk south on Alexander Ave until you get to 134th St. The building is on Alexander Ave. between 134th St. & Bruckner Blvd. It's the first building on the right hand side of the street. Take E 125th St/Dr Martin Luther King Jr Blvd. Labels: "Alfredo Marin Gaos", "Ali Irazarry", "Augusto Marin Rodas", "Janire Diaz Nazario", "LDR Studio Gallery", "Lorna Cruz Aguilu", "Luis D. Rosado", "Puerto Rican Day Parade", "Rich Rossi"
Here are some activities planned by the Bronx Council of the Arts. Those interested in exploring Bronx culture should consider going on the following free trolley tours. Join us for ¡Viva Cultura! Celebrating Puerto Rican Heritage in the Bronx. Venues Include: Art exhibitions, dance performances, story telling, a writing workshop, 152nd Street Cultural Festival, a Cha ChadDance class, and more! Labels: "Bronx Council of the Arts", "Bronx Culture Trolley", "Bruckner Bar and Grill", "LDR Studios", "Longwood Art Gallery"
Here is a free event at the Bronx Museum of the Arts that should be uplifting to everyone involved. I am especially happy that James McSherry will be the MC for the Bronx story telling event. Besides being a gentleman, James McSherry is the writer, producer and actor of 2011 Cannes Film Festival entry "Poetry Man". The event should be inundated with muses and robust creative energy. For more information on James McSherry please do see the web link included below. It should be a great event for everyone interested in improving their story telling and writing skills. Kudos to everyone involved. 1040 Grand Concourse at 165th St. Think you know the Bronx? Think again. Join us for an evening of storytelling inspired by art and the Bronx. Bring your own stories to share too! We have a very eclectic mix of storytellers this time around who are educators, poets, high school students, and even high school teachers! Their personal narratives will be inspired by the selected works of art from the exhibition, "The Kid in Me", a NYC teen exhibition curated by the Bronx Museum's Teen Council. After the professionals, audience members will be invited to participate in our open mic session and tell their personal tales. You'll have a chance to create a work of art with our friends from Paper Tiger TV! The goals of Bronx Stories are four-fold: to challenge stereotypes about the Bronx and promote positive images of the borough; provide a platform for voices from the community and space for the community to come together; encourage deeper engagement with art; and to create a welcoming and inclusive atmosphere in the museum. Labels: "Bianca Ortiz", "Bronx Museum of the Arts", "Hetty Fox", "James McSherry", "Storytelling", "Stuart Nagar", Ashleign Ham", Judith Heineman", Monique Simmons", Peggy Robles-Alvarado"
For all the film buffs out there, here is a film festival that starts tomorrow, in East Harlem. I took some basic information from thier web site which I also listed below. "The East Harlem International Film Festival (EHIFF) will feature over 42 films during a 5-day period from June 1-5, 2011 in East Harlem, New York. The films that have been selected for this year’s festival are broadly international and hail from as far away as China, India, Russia, South America, The Caribbean, and as local as East Harlem. EHIFF 2011 has three categories: Narrative Features, Documentary Features and Short Films. All entries are entered into a competition and judged by people in the entertainment industry. The award ceremony will take place on Sunday, June 5th at Piatto D’Oro, an Italian Restaurant located in East Harlem. Along with showcasing films, EHIFF will also feature educational panels on the business of casting films, film distribution, and the process of filmmaking. This is the first year for The East Harlem International Film Festival. Join us, as we take you around the world in five days." Labels: "East Harlem International Film Festiva;", "EHIFF", "Piatto D'Oro"
I hope everyone enjoyed their Memorial Day weekend. The following message was e-mailed over the weekend from our Governor's office. May we always remember and protect those that served our nation. Thank you to everyone that served. Today we honor the memory of those who lost their lives in the service of our country. Memorial Day is a time to reflect upon the sacrifices made by members of the armed services and express our gratitude for the protection they continue to provide. During this time of war, we must always keep in mind the families who will forever be separated from their loved ones. We mourn their loss and honor the sacrifice of heroes of all generations. On behalf of all New Yorkers, I would like to thank the brave men and women of the U.S. Armed Forces, both from New York and across the nation, for their dedicated service. Labels: "Gratitude", "Honor", "Memorial Day", "Veterans"
Here is another enjoyable art piece by Tats Cru Inc., AKA the "Mural Kings". The graffiti piece can be found at The Point Community Center in Hunts Point, were their main office is located. For more information on the crew that produces these beautiful and interesting art pieces, I posted their web site below. Besides enhancing our borough with interesting art pieces it's great that the crew turned their skills into a commercial venture. Are their any other art crews in the Bronx undertaking similar ventures? Labels: "art", "Bronx Graffiti", "Tats Cru", "The Mural Kings"
Here is information on a cyber bullying summit next month organized by our NYC Council and The New York Times. While advances in technology have resulted in many great opportunities for our children, they have also led to new threats to their safety and well-being. Sponsored by The New York Times Company, this educational event will bring together widely renowned leaders in technology and Internet safety. Facebook, Microsoft, MTV and other social media outlets will be available at the summit to speak to parents about what they can do to protect their children from cyber bullying and encourage responsible online behavior. Counselors, child advocates, and representatives from the NYC Department of Education, the NYC Department of Youth and Community Development, and the NYC District Attorney's Office will also be at the summit, as will cyber bullying and cyber safety expert, Parry Aftab, founder of Wired Safety.com and creator of CyberBullying.org. We're thrilled to bring together this group of experts from industry, government and advocacy so we can provide parents and guardians the tools and information they need to keep their children safe in today's digital age. If you would like to RSVP to the summit, please click here or visit us online at www.council.nyc.gov. You can also share this event with friends on Facebook at http://www.facebook.com/event.php?eid=213979951956411. Please note that space at The Times Center is limited. If you have any questions about the event, feel free to contact Nick Rolf in the Council's Community Outreach Unit at (212) 442-5765 or nrolf@council.nyc.gov. Thanks and we hope to see you at The Times Center on July 18th! Labels: "Cyber Bullying", "facebook", "MTV", "Parry Aftab", "The NYC Council", "Wired Safety", Microsoft"
As prelude to Bronx Week, the 13th annual Bronx Bankers Breakfast was held on May 13th. The event was organized by the Business Initiative Corporation of New York (BIC), which is an affiliate of the Bronx Overall Economic Development Corporation. The event attracted major lending institutions, officials from the U.S. Small Business Administration and local political leaders. The goal of the annual event is to promote cooperation between private and public entities and increase responsible lending in our Borough. This year’s event was open to the public and includes a breakfast for a $50 fee. The breakfast was held at the Villa Barone Manor. Labels: "BIC", "Bronx Bankers Breakfast", "Business Initiative Corporation of New York", "US Small Business Administration"
Here are more details on the press conference held by NYC Comptroller Liu on the brewing CityTime payroll scandal. Besides further investigations, $2,470,522 will be returned to NYC taxpayers by Science Applications International Corporation (SAIC). SAIC is the corporation that was entrusted as the prime contractor on the CityTime project. Hopefully the money will help restore or maintain vital programs threatened by budget cuts. Kudos once more to Comptroller Liu. “Earlier this afternoon, my office was provided with a letter written to the Executive Director of the Financial Information Services Agency (FISA) by Science Applications International Corporation (SAIC), the prime contractor on the CityTime project. We were informed that SAIC had terminated their senior project manager who led the CityTime project. “The name of that employee is Gerard Denault. “SAIC has determined that Mr. Denault violated SAIC’s policies and standards with respect to timekeeping practices while working on CityTime. He routinely billed hours to the CityTime project that he did not in fact work. “By their own admission, this latest development now implicates, for the first time in this scandal, SAIC. The very company entrusted by our City to build a timekeeping system for NYC employees has grossly mismanaged their own time keeping, and in the process over charged the city for sums of money – still to be determined. “SAIC now says they will now refund $2,470,522 to the city coffers for the time Mr. Denault billed to hard working NYC taxpayers. “A few moments ago I sent a letter to the Mayor because I believe we need to work together. “I am asking him to join me in calling on the Department of Investigation along with all other relevant authorities to conduct a comprehensive review of other possible violations by SAIC, and I am proposing that the City withhold any future payments to SAIC pending the outcome of the investigations. “This is a sad day for the New York City taxpayer. “With the proposed budget cuts looming, we at least need to tightly manage expensive outside consultants. Labels: "CityTime Project", "Gerard Denault", "Mayor Bloomberg", "NYC Comptroller Liu", "Science Applications International Corporation (SAIC)"
The following elected officials are conducting a town hall meeting tonight. Anyone interested in expressing themselves or hearing about pertinent neighborhood issues please do review the information posted below. Assemblyman Jeffrey Dinowitz, Congressman Eliot Engel, Council Member Oliver Koppell, State Senator Jeff Klein, the SAR High School, and the SAR High School’s Political Action Alliance will host a town hall meeting to discuss critical issues such as the federal, state, and city budgets, neighborhood school funding, senior citizen concerns, the expiration of tenant protection laws, the MTA, parking and transportation issues, job creation and economic development, as well as many other important matters. They are eager to hear their constituents’ concerns and opinions. Labels: "Assemblyman Dinowitz", "Councilman Oliver Koppell", "State Senator Klein", "U.S. Congressman Engel"
Here is information sent by the Benjamin Franklin Reform Democratic Club. They organized a forum to discuss issues related to the Indian Point nuclear power plant. Tonight’s meeting is at 7:30 at Tibbett Towers. Indian Point – Should We Shut It Down? The Benjamin Franklin Reform Democratic Club will host an open forum on Wednesday, May 25th 2011 at 7:30pm at Tibbett Towers, 3130 Irwin Ave., between West 231st and 232nd Sts., to discuss the controversial question of whether the Indian Point nuclear power plant should close its doors. Long-time community activist Marilyn Elie, who lives two miles from the plant, will argue that it’s time to close the plant to avert disaster. She is co-founder of the Westchester Citizens Awareness Network and leading member of the Indian Point Safe Energy Coalition (IPSEC). Defending the plant’s safety will be a representative for the Entergy Corporation, which runs Indian Point. Entergy is the second largest generator of nuclear power in the country. Located in Buchanan, N.Y., Indian Point employs over a thousand people and produces more than two thousand megawatts, 10 percent of the state’s total energy demand. The plant is 34 miles from Tibbett Towers, the site of the forum. The public is welcome and questions will be invited from the audience on this hot and timely topic. Labels: "Benjamine Franklin Reform Demoratic Club", "Indian Point", "Marilyn Elie", "Nuclear Power", "Tibbbet Towers"
Here is information on a workshop for construction firms interested in securing construction work with the NYC School Construction Authority (SCA). serves as the SCA Chair, and that the management of the Department of Education’s Capital Program has been consolidated under one agency, the SCA. Making the SCA completely accountable for the Capital Program had several goals: 1) to improve of the construction process; 2) to reduce school construction costs by simplifying design standards; and 3) to increase competition among contractors. For additional information, please visit www.nycsca.org. This event was made possible by the New York City Council. Labels: "Evangelina Gelladola", "Lloyd Mair", "New York City Council", "NYC School Construction Authority", "NYCSCA", "SCA", "SoBRO"
Here is news on free MRI's available today and tomorrow. Anyone interested in a free MRI, please do review the following press release. Bronx, New York – Council Member Joel Rivera and The Brain Tumor’s Foundation “Bobby Murcer Mobile MRI Unit” will provide free MRI scans for the community located outside of 1901 Southern Boulevard on May 25 and 26 from 9am to 5pm. In recognition of May as Brain Tumor Awareness Month, the Councilman encourages the community to make use of the free MRI scanning as brain tumors can occur at any age. Each year, more than 700 men and 600 women in New York State are diagnosed with cancer of the brain and nervous system. More than 400 men and 300 women die from this disease each year in New York State. “A non-invasive, radiation-free simple MRI brain scan can save your life. This screening is open to all residents in the community and I urge everyone to participate in this exercise as early detection is the road to prevention. Working with Bobby Murcer MRI Unit we are able to provide this service to Bronxites that may not have the financial means to do so otherwise,” stated Councilman Rivera. Labels: "Bobby Murcer MRI Unit", "Brain Tumor Awareness Month", "Councilman Joel Rivera", "Free MRI's", "The Brain Tumor Foundation"
While scanning the LGBT Chamber of Commerce web site, I came across a spoken word event at the Nyorican Poets Cafe. Besides the historic venue, this Friday also sports a performance by Bronx poet, actress, hip hop star and activist Caridad De La Luz (aka 'La Bruja'). One of her many contributions includes her provided much of the soundtrack for the film "Gun Hill Road". She also was kind enough to MC the red carpet gala concluding this years 1st ever Bronx Week Film Festival. She has a captivating spirit, the heart of an angel and is always a positive influence for our borough. I hope everyone goes to her performance on Friday. Please do see the post below and links provided for additional information about 'La Bruja" and the LGBT Chamber of Commerce. La Bruja fan. I will be signing books after the Performance. All ages are welcome but there is some adult content." Special $1 raffle to win a free book and The Boogie Rican Blvd. musical dvd/cd. Carina De La Luz - Vazquez and Simply Rob of El Grito de Poetas will be reading. Labels: "Boogie Rican Blvd", "Caridad De La Luz", "G-Bo the Pro", "Gun Hill Road", "LGBT Chamber of Commerce", "Nuyorican Poets Cafe", "Poetry", "Simply Rob", "Vazquez", El Grito de Poetas", La Bruja"
Here is an organization promoting youth development through wooden boat building and on-water education in the South Bronx. Anyone interested in attending this Saturdays boat launching should read the following post. Saturday’s activities include music and a free barbeque. Come celebrate the end of the Spring 2011 semester! Live music by the Abrazos Orchestra! Labels: "Abrozos Orchestra", "Environmental Science", "Legacy" Sail Boat", "Maritime Skills", "Rock the Boat", "Tony Archino"
Here is news on Assemblyman Dinowitz pushing for a Historical District in Van Cortlandt Village. The proposal would prevent present and future developments believed detrimental to the integrity of the neighborhood due to its historical significance. Assemblyman Jeffrey Dinowitz (D-Bronx) wrote to the president of the New York City Housing Development Corporation today in support of recognition of a Historic District in the Van Cortlandt Village area. The proposed area would include both sides of all streets starting at the most southern part of Fort Independence Street at Sedgwick Avenue going north and westward for the entire Fort Independence Street to Orloff Avenue, then northward along Orloff Avenue to Van Cortlandt Avenue West, then eastward to along Van Cortlandt Avenue West to Sedgwick Avenue, and southward along Sedgwick Avenue to Fort Independence Street, including all of both sides of Giles Place. This area includes the largest Revolutionary War Era fort in the Bronx – the Fort Independence – as well as Olmsted’s curvilinear street design of 1877, and the Shalom Aleichem Houses which sit atop the hill at Cannon Place. 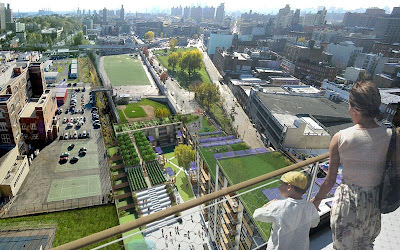 Assemblyman Dinowitz has expressed strong reservations about the Housing Development Corporation’s support of construction of a large building on the empty lot located between Cannon Place and Fort Independence Street. He is also concerned about the structural integrity of the retaining wall at Cannon Place. The site, wedged between these two narrow Olmsted streets, is across the street from one of the buildings in Shalom Aleichem Houses which has been identified as eligible for the National Register of Historic Places (a formal application to the National Register is pending), and within one block of the Jerome Park Reservoir, which is already listed on the National Register. “This section of Van Cortlandt Village should have been designated a historic district long ago. The uniqueness of this area and its place in history clearly qualify it for such designation. In addition, we must do everything possible to protect this neighborhood from runaway development and over-building. I commend the Fort Independence Park Neighborhood Association for fighting to protect this beautiful community,” said Assemblyman Dinowitz. Labels: "Assemblyman Jeffrey Dinowitz", "Historic Districts", "Revolutionary War Era Fort", Van Cortlandt Village Area"
Pink Slips Prompt L.A. Teachers to Rap in New Video: "Two Teachers and a Microphone"
Since the previous post was about teachers who need a drink due to the steady privatization of our school system and over emphasis on test preparation, here is video made by teachers in Los Angeles that might help explain their position. The name of the video is, "Two Teachers and a Microphone". They served Los Angeles' youth, got served pink slips, and now they are serving up fresh educational rhymes over the internet. Labels: "School Privatization", "Test Preperation", "Two Teachers and a Microphone"
Here is some information sent by a teacher organizing a Bronx teacher happy hour, at one of my favorite Bronx watering holes. For everyone attending, say hello to Benny (G-Bar Manager), and enjoy the great food and drinks. for our schools? For students? For teachers? Labels: "G-Bar", "School Closures", Bronx Teacher Happy Hour"
Here is an informative press release send by the Friends of Van Cortlandt related to a new event that sound like fun and a great way to enjoy a walk in the park. The event is scheduled for Wednesday, June 15th. The RSVP date is June 8th. Come to experience one of the Van Cortlandt Park’s seven wonders. come discover the first of the seven and help us determine the others. 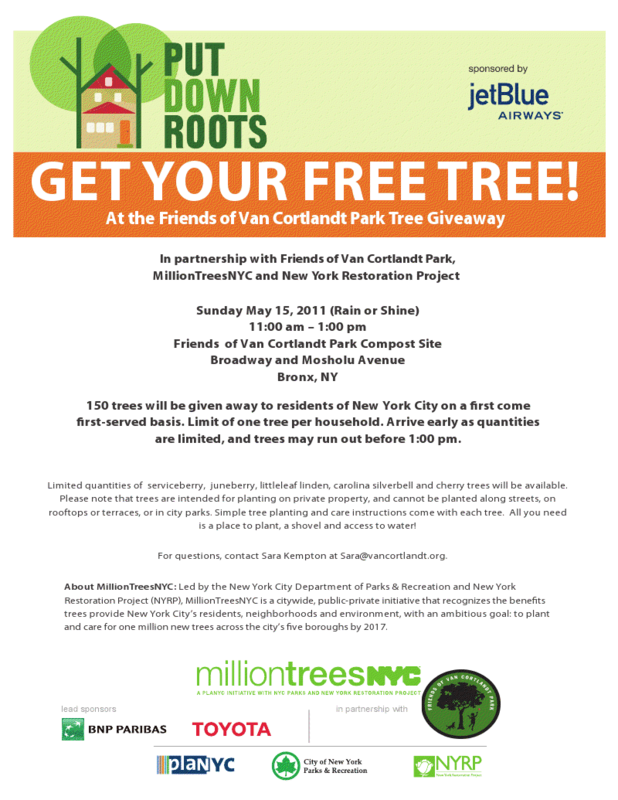 Participants will be able to meet the Friends and learn more about Van Cortlandt Park. for this event by June 8th. Labels: "Christine Taylor", "Friends of Van Courtland Park" "FVCP", "hike"
Please excuse my lack of posts during the last few days. Besides organizing and executing the 1st ever Bronx Week Film Festival ,with my partners at Olympia Film Locations Inc., I also enjoyed many of the Bronx Week activities. Bronx Week is held annually in May, so I would start logging to the above web site in April. 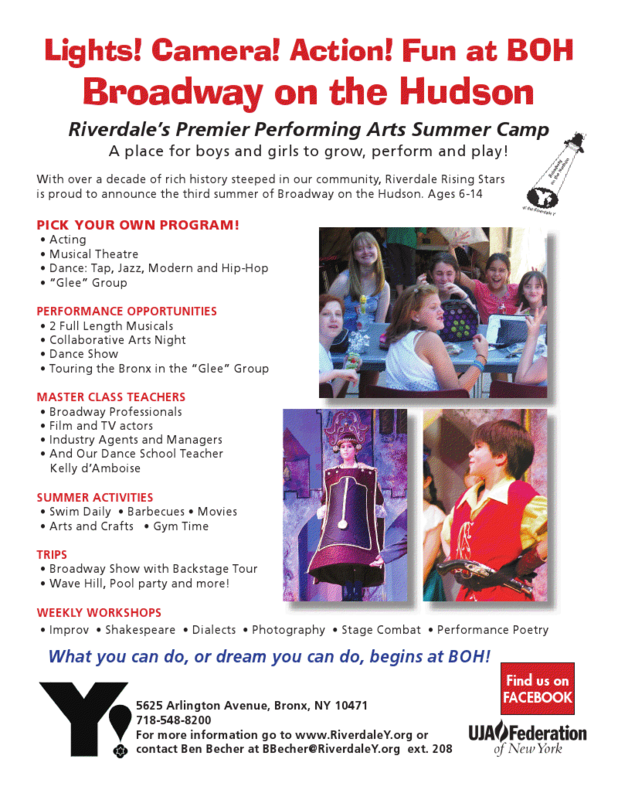 In addition, activities are posted year long for anyone wishing to see what fun activities the Bronx has available before next years Bronx Week festivities are posted. Each year Bronx residents who have made their mark on society are honored with their induction to the Bronx Walk of Fame. As stated below, this year’s inductees were Chazz Palminteri, Irene Cara, Charles Latibeaudiere and Joy Bryant. I enjoyed hearing each speak, but must admit I loved hearing Chazz Palminteri’s story about how after failing to make it as an actor in Hollywood he wrote “A Bronx Tale” and had Hollywood come to him. It was interesting to learn how much of “A Bronx Tale” was based on his life experiences including his first love to an African American at age 17 in a time when race relations were very different. Another treat of the evening was meeting the man who started Bronx Week 40 years ago. His name is Professor Lloyd Ultan. He is the official Bronx Historian. He is a wealth of knowledge and a total pleasure to speak with. The celebration originally started out as one day event. He introduced the idea after discovering that similar Bronx pride festivals were organized prior to the Great Depression. Congratulations to everyone who helped make this weeks Bronx Week a huge success. Bronx Borough President Ruben Diaz Jr will host the Annual Bronx Ball, a party honoring this year's inductees into the Bronx Walk of Fame. This black-tie awards gala brings together the Bronx’s business, arts and civic leaders to welcome home Bronx-born celebrities. The Bronx Ball pays tribute to those proud Bronx natives who Borough President Diaz will induct into the Bronx Walk of Fame the following morning. The Class of 2011 inductees are: Chazz Palminteri, who wrote and starred in “A Bronx Tale” and then turned it into an award-winning stage production; Irene Cara, Grammy and Golden Globe winner, Joy Bryant, actress and former fashion model who currently stars in Parenthood; and Charles Latibeaudiere, Co-Executive Producer of TMZ. The honorees will be inducted into the Bronx Walk of Fame on Sunday, May 22, at 11:00AM on the Grand Concourse at 161st Street. Borough President Ruben Diaz Jr. will unveil permanent street signs bearing their names. Labels: "A Bronx Tale", "Bronx Ball", "Charles Latibeaudirer", "Chass Palminteri", "Irene Cara", "Joy Bryant", "Parenthood:, "TMZ"
"When a young Italian American couple living in the Bronx in 1968 get over their heads financially, she starts working nights and he starts moonlighting at a chop shop. These jobs bring new stresses to their relationship until he sets out with a gun to kill the love of his life. Will there be an intervention in time?" Labels: "Anton Evangelista", "Bronx Week Film Festival", "Intervention", "Italian-American Cinema"
It's good to see a Congressman who represents the Bronx advocating and protecting funding for the arts. On Wednesday, during a hearing for the Interior, Environment, and Related Agencies Appropriations Subcommittee, Congressman Serrano expressed his continued commitment to the arts, especially the work of traditional, cultural artists. “Even during difficult budget times, we have to protect, preserve and grow the arts,” Serrano said. During the hearing, Serrano also asked Rocco Landesman, Chairman of the National Endowment for the Arts (NEA), about the status of the National Heritage Fellowship (NHF), which is in danger of being discontinued. The NHF is a one-time award of $25,000 that is made to artists to support their efforts to conserve America's many cultures for future generations (last year’s NHF awardees included 2 artists from New York). Chairman Landesman responded that he has met with key leaders with regards to the NHF and will be taking their thoughts into consideration, as the NHF is considered an important and valuable part of the NEA. Labels: "National Heritage Fellowship", "NHF", "Rocco Landesman", "U.S. Congressman Serrano"
Congratulations to the young musicians who were honored by the recent contest sponsored by the Bronx Arts Ensemble. (Bronx, NY) The Bronx Arts Ensemble has awarded three First Prize Winners in its recent Jonathan Bingham Young Bronx Artist Contest, held at Amalgamated Houses on Saturday, April 23. Each of the winners will receive $500 and a solo performance with the BAE at one of its subscription concerts in the 2011-2012 season. Winners included flutist CHRISTINE DOOKIE, a junior at Celia Cruz High School of Music, JAY LEE, pianist and an 8th grade student at Horace Mann School in Riverdale, and pianist MICHAEL GELLMAN, a junior at Bronx High School of Science. Runner-Up in the contest was Vincent Shieh, violinist, a junior at Bronx Science High School, and Honorable Mention in the contest went to singer Jarrett Parker, a senior at Celia Cruz High School, and pianist Oscar Rodriguez, a 9th grader at Bronx Science High School. FLUTIST CHRISTINE DOOKIE has attended the Bloomingdale School of Music and Harlem School of the Arts, and received a 100 award in New York All-State competitions for 2010. She is a student of Tia Roper, and performs with the Celia Cruz High School Band and Orchestra. PIANIST MICHAEL GELLMAN is a student of Tania Tachkova and has attended the 92nd Street Y School of Music and Bloomingdale School of Music in Manhattan. He has won the Recanti-Kaplan Scholarship for study at the 92nd Street Y and Music Access Project Scholarship for study at Bloomingdale School. A winner of numerous scholarships and awards, Michael performed at the 80th Birthday Gala for Nobel Laureate Elie Wiesel, and has participated in master classes with Orli Shaham and Leon Fleisher. He has performed at the Tenri Cultural Center, Weill Art Gallery and at St. Paul’s Cathedral. PIANIST JAY LEE attends the Pre-College Division at the Manhattan School of Music and is a student of Nina Svetlanova. He won First Place in the 2009 Manhattan School of Music Precollege Concerto Competition, and was the recipient of the Ralph Zola Memorial Scholarship in 2009 and 2010. Judges for the BAE competition were William Scribner, bassoonist and Executive/Artistic Director of the BAE; John Freeman, composer and Contributing Editor of Opera News magazine; and oboist Marsha Heller, faculty member at Montclair State Teachers College (NJ). Labels: "Bronx Arts Ensemble", "Christine Dookie", "Jay Lee", "Michael Gellman", "Oscar Rodriguez", "Vincent Shieh", Jarrett Parker"
Here is a press release about the Square at the Fair coming up this Saturday. Enjoy. Free parking at the Hutchinson Metro Center located at 1200 Waters Place for all festival go-ers with shuttle service to and from all day. Join the hot dog eating contest in front of McDermott's Pub at 2pm. Don't miss the many raffles for great prizes by visiting our merchant and sponsor booths throughout the fair. BRONX, NY- The Association of the Merchants & Business Professionals of Westchester Square, Inc., the Bronx Business Alliance and the Bronx Council on the Arts, encourage Bronxites to attend the 3rd Annual “Fair @ The Square” on Saturday, May 14th from 12 to 6 PM along the streets of Westchester Square between St. Raymond and Westchester Avenues. This multi-cultural event will feature an all day concert showcasing New York City’s best groups performing oldies through today’s great music. The show will be hosted by Bronx News anchor, Ray Raimundi, of News 12 the Bronx, and Dennis “Dion” Nardone, of WVOX 1460 AM radio. From Doo-Wop to Hip-Hop, you will catch it on the main stage at St. Raymond Avenue. The artist line-up is still growing but, just to name a few performing at the main stage are Latin Sensation Yamilet Mia, Hip-Hop craze Salese & Friends, the legendary Streets of the Bronx Band, the ultimate dance band Just Nuts, the Bronx’s very own Elvis Tribute Artist Gene Di Napoli and a Bangladesh performance by Bahrati Kemraj. Kids will enjoy the day at Owen Dolen Park where a full children’s carnival will take place, adults will enjoy dozens of vendors and merchants displaying their wares, and services, and restaurants offering up great food. Another highlight is the annual Art Walk showcasing local Bronx artists and their works in a variety of spaces and windows and at tables throughout the Square, with scheduled guided tours. This event is sponsored by The Hutchinson Metro Center, The New York Daily News, Health First, Metro Optics, Rebekah Nursing Home, Verizon, Exit Realty, Bronx Knows, Con Edison, Westchester Medical Center, BronxNet Television, News 12 - The Bronx, and The Bronx Times Reporter. Here is more on the living wage controversy. NYC Councilman Oliver Koppell shows solidarity on the issue with NYC Comptroller Liu and most other Bronx elected officials. Council Member Oliver Koppell strongly condemned misleading statements made by members of the Bloomberg administration regarding a preliminary report on the impact of living wage legislation Koppell has introduced. “While the Mayor’s staff has made grandiose statements about the dire consequences of my proposed bill, a close reading of the ‘Key Findings’ summary while significantly flawed, portrays a different reality,” said Koppell. “The report,” said Koppell, “even with its faulty analysis, had some positive findings and conclusions with regard to living wage legislation.” For example, it projects that 34,000 – 62,000 workers would receive increased wages. It states at several points that living wage mandates actually “reduce urban poverty.” This finding should be given prominence because it is based on actual experience with living wage ordinances in other cities, not on models based on questionable data. Another conclusion in the report was that the overall impact on the economy would be de minimis. In great part this is due to the fact that the future jobs that would allegedly not be created, according to the report, are the result of vastly overstated concerns about potential lawsuits by individuals to obtain lost wages at the higher living wage rate and enforcement actions against recalcitrant employers which would be conducted by the City Comptroller under the proposed law. Additional losses to the economy, according to the report, can be found in its projection that 6,000 – 13,000 jobs would not be created if the living wage law was to be enacted. Proponents of the legislation do not accept the premise that a living wage mandate will cause a reduction in jobs created. Nonetheless, it is significant that the report only projects such a small amount of job loss. Here is the reaction by our City Council related to a recent incident where a Manhattan cabbie ran over Bronx youth who new their rights and demanded that the cabbie take them home, even though they lived in an outer borough. For anyone that was ever been denied a ride home from a cabbie in Manhattan, here is a small dose of justice a little bit too late. BRONX, NY ― The New York City Council on Wednesday unanimously passed legislation sponsored by Council Member James Vacca to impose steeper fines on taxi drivers who refuse to take passengers to any destination within the five boroughs, as required by law. Vacca introduced the bill in late March, just weeks after four young men from Morris Park were refused service after a night out in Manhattan. That refusal ultimately turned violent when the driver became irate, sped away from the scene, and hit two of the men, one of whom is still in recovery. Specifically, the bill applies to three violations: refusing to take a passenger to any destination in New York City, inquiring where a passenger is going before the passenger enters the taxi, and charging more than the legal fare. Maximum fines will increase from $350 to $500 for the first offense and from $500 to $1,000 for the second. Future offenses within 36 months would continue to lead to license revocation, but would also include a $1,000 fine for each additional offense. Vacca’s legislation was introduced jointly with Council Member Debi Rose of Staten Island, in concert with the Mayor and the New York City Taxi & Limousine Commission. The Committee on Transportation, which Vacca chairs, passed the bill unanimously, also on Wednesday. Here is more on the Living Wage controversy from NYC Comptroller Liu. Labels: ", "Living Wage", "NYC Comptroller Liu"
Please see below the official schedule for the 1st ever Bronx Week Film Festival. With the exception of Sundance Film Festival sensation "Gun Hill Road", which will be screened at the Concourse Plaza Multiplex Cinema, all other film festival screenings will take place at the Brucnker Bar and Grill located at 1 Bruckner Boulevard. Tickets for "Gun Hill Road" and the other outstanding Bronx films included in the festival will be available at the following web address at 10am today (May 9th). Please log on know to review the list of films available for viewing at the festival. and hit the Bronx Week Film Festival button. Please log on to get your free tickets today at 10am before they run out. The tickets are FREE courtesy of Olympia Film Locations Inc. and select sponsors on a first log on, first serve bases. Rush tickets will be made available at the door subject to availability. Please e-mail any questions or comments to; info@olympiafilmlocations.com. The inspiration for the film festival came form Bronx Director Rashaad Ernesto Green and his great success with his first full length feature film, "Gun Hill Road". The movie will be shown for the first time ever to the Bronx Public as part of the film festival organized by Olympia Film Locations Inc. Please see the video and synopsis taken from the Sundance Film Festival web site. Please make sure to log on to secure your tickets today before theater capacity is reached. Seating is limited. "After three years in prison, macho Enrique (Esai Morales) returns home to the Bronx and finds things changed. His wife, Angela (Judy Reyes), is distant, and his teenage son, Michael, has come out as Vanessa, a transgender woman. Unable to accept his child for who she is now, Enrique clings to his masculine ideals while Angela attempts to hold the family together by fiercely protecting Vanessa. Still under the watchful eye of his parole officer, Enrique must become the father he needs to be or, once again, risk losing his family and freedom. The heart of Gun Hill Road lies in two places: a father’s inability to escape the vicious cycle of his life, and the richly drawn character of Michael/Vanessa (newcomer Harmony Santana is unforgettable). Writer/director Rashaad Ernesto Green’s first feature film is a complex family drama, told with gentle humor, sensitivity, and a deep understanding of the environment that defines its inhabitants." Labels: "Baby Bomber", "Bronx Film Festival Schedule", "Bronx Paradise", "Gun Hill Road", "Krackoon", "NY Mixed Martial Arts", "Off the Hook", "Poetry Man", "Quentine Fortune", "The Alpo"
Bronx Borough President Ruben Diaz Jr. will kick off this years Bronx Week celebration on May 9th at 11am at Bronx County Building Rotunda. In addition to the new events mentioned below, Bronx Week activities will also include the 1st Ever Bronx Week Film Festival. Olympia Film Locations Inc., in cooperation with Bronx film makers organized a 4 day schedule staring on Monday, May 16th. We encourage everyone to attend the ribbon cutting Ceremony to be held at the Bruckner Bar and Grill at 6pm. The Film Festival runs through Thursday, May 19th concluding with a red carpet gala night at the Bronx Museum of the Arts. The majority of the films will be shown at the Bruckner Bar and Grill located at 1 Bruckner Boulevard. Sundance Film Festival sensation "Gun Hill Road", by Bronx Director Rashaad Ernesto Green will be shown for the first time ever to the general public in the Bronx at the Concourse Plaza Multiplex Cinema at 4pm. The directors, producers and or actors will be present for Q & A session after each showing. Any additional questions can be directed to; info@olympiafilmlocations.com. The schedule will also be made available on a separate post right here on the BoogieDowner as well but tickets can oly be secured at the above web site starting at 10am as stated above. Enjoy the festivities. Bronx Borough President Ruben Diaz Jr. will announce that the Empire State Building will light up in the colors of the Bronx flag to honor the 40th anniversary celebration of Bronx Week. The announcement will be made during the official kick off of Bronx Week 2011. Bronx Week 2011 will offer many new events, such as an urban farm tour, a centenarian celebration, a festival at the Arthur Avenue Retail Market and a hip hop block party, as well as some of the more popular events from past years, such as the Bronx Trolley, which this year is dedicated to the 420th birthday of Anne Hutchinson, the DiVa Spa, the Business Breakfast, the Health Fair and the annual Bronx Parade. All the events are organized to pay tribute to the progress and success of Bronx people, businesses, educational and cultural institutions and civic groups. During the kick off, Borough President Diaz will also announce the names of the celebrities and notable Bronxites that will be included on the Bronx Walk of Fame 2011. Labels: "1st Ever Bronx Week Film Festival", "Bronx Week", "Film" "Cinema", "Free Events", "Gun Hill Road", "Olympia Film Locations Inc.", "Rashaad Ernesto Green", "Ruben Diaz Jr.", "Sundance"
There is a LGBT carrier fair set for May 26th at Hosts Community College. The fair will take place at the Savoy Multipurpose Room located on the second floor of 125 Walton Ave. Please note they have an option were individuals can send in their resumes for pre-screening by potential employers. 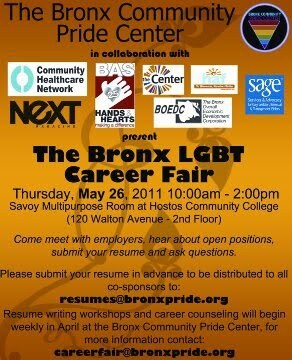 To take advantage of the pre-screening option please send your resume to resumes@bronxpride.org. Good luck to everyone seeking employment. Labels: "BOEDC", "Bronx LGBT Fair", "Bronx Overall Economic Development Corporation", "Bronx Pride", "Community Healtth Network", "Hostos Community College", "Sage"
Here is more of NYC Comptroller Liu protecting our tax dollars from "high priced" technology-related contracts that have been riddled with alleged corruption issues. “While the Mayor’s Budget presents a picture reflective of the lingering effects of the recession, it should be noted that throughout the economic crisis, City agencies have spent billions of dollars on high-priced outside consultants resulting in runaway spending on technology-related contracts. Unfortunately, the Executive Budget offers no respite. The continued lack of oversight of subcontractors working on City projects has resulted in the City being bilked out of millions of dollars - dollars that could have been better utilized elsewhere. Although the Mayor has heeded our concerns and acknowledged that more needs to be done to rein in spending on consultants, now is the time to fully rethink the proposed spending plan on IT projects, especially within the Department of Education. As we have seen in recent months, there are serious gaps in the DOE’s ability to properly keep track of their prime and subcontractors. Before we commit critical funding towards more technology contracts, we must consider the necessity of these projects when compared to the proposed service and personnel cuts the Mayor has put forth. Labels: "City Contracts", "Mayor Bloomber's 2012 Budget", "NYC Comptroller John C. Liu", "runaway spending"
Here is a great program sponsored by AT&T to help provide mentoring, full scholarships to summer experiential education programs, access to college and financial aid counseling and more. Kudos to AT&T for their 100 million dollar commitment to the community. 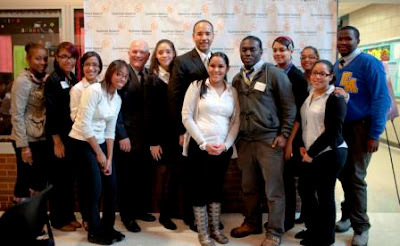 Caption: (l-r) Summer Search New York City participants Ashley Gonzales, Kyabell Glass, Annell Ovalles, Laurin Ellis, Marjorie Abreu, Kassandra Cardona, Alex Williams, Nikarly Santiago, Erika Marte, Kattery Guzman and Tiga Anderson meet with AT&T New York President Hal Lenox (fifth from left) and Bronx Borough President Ruben Diaz, Jr. (seventh from left) at a Summer Search reception held at the Bronx School for Law, Government and Justice May 4. Last night (May 4) the Bronx School for Law, Government and Justice welcomed Bronx Borough President Ruben Diaz, Jr., AT&T New York President Hal Lenox and Summer Search New York City Executive Director Karina Kirsch to honor the impact the Summer Search program has had on high school students in the South Bronx and across the City. Summer Search is a non-profit youth leadership program that provides high school students a unique combination of intensive, long-term mentoring; full scholarships to summer experiential education programs; access to college and financial aid counseling; and a lasting support network, including access to professional development skill-building for alumni. AT&T sponsors Summer Search through its “AT&T Aspire” program, a $100 million multiyear commitment to confronting the high school dropout crisis and preparing students for continuing education and the workforce. Summer Search New York City is currently focusing its growth in two of the most underserved areas of the City, the South Bronx and Brooklyn. More than 99 percent of students who have participated in Summer Search graduate high school and 85 percent graduate college, as compared to the current 50 percent and 11 percent graduation rates for high school and college, respectively, for South Bronx students. Labels: "Ashley Gonzales", "Aspire Program", "AT and T", "AT andT", "Bronx Borough President Ruben Diaz Jr.", "Hal Lenox", "Kyabell Glass", "Lauren Ellis", "Summer Search NYC", Annell Ovalles"
NYC Council members Oliver Koppell, Robert Jackson and Julissa Ferreras are fighting for continued funding for "Samaritans of NYC", so they can continue their 24 hour suicide prevention hotline. The suicide statistics presented below are alarming and show the need for the program. The press release states 69,000 calls were made last year to the hot line. Concerned about the increase in suicide, especially among young people, Council Member Oliver Koppell, Chair of the Committee on Mental Health, Mental Retardation, Alcoholism, Drug Abuse and Disability Services, is requesting that the City Council continue its funding for the community education program and the Citywide 24-hour Suicide Prevention Hotline operated by the Samaritans of NYC. Koppell, is hosting a briefing for colleagues, in conjunction with Council Member Robert Jackson, Chair of the Education Committee, and Council Member Julissa Ferreras, Chair, Committee on Women’s Issues, about the high rate of suicide particularly among New York City teen-agers and the need to support suicide prevention efforts. A recent CDC study found that 10% of NYC high school students reported suicide attempts, 50% of which required medical attention. This was particularly marked among young Latina girls, where suicide attempts greatly exceeded those of the general population. Koppell has indicated that, in general, suicide is all too common, with twice as many Americans dying from suicide as from AIDS, and 40% more than from homicide. He has further said that the risk is particularly high in New York City where, because of its widely diverse population, there are a greater number of people in danger of suicide than anywhere in the world. The organization operates the city’s only completely confidential 24-hour suicide prevention hotline, answering over 69,000 calls last year from those who were in distress, depressed and in crisis. Its suicide prevention public education program has trained over 30,000 health providers who supply education and technical support to Bronx, Queens and Manhattan public schools, as well as to government agencies and community-based organizations. “The 24-hour Hot Line operated by the Samaritans of NYC with its over 100 caring volunteers, is in the forefront of our efforts to avert suicide attempts,” Koppell said. “In view of the increased suicide risk facing our young people, it is particularly important that the Council continue to provide funding for this vital resource, as well as for the organization’s public education program. Labels: "24-hour suicide prevention hotline", "Jelissa Ferreras", "NYC Councilman Oliver Koppell", "NYC Councilman Robert Jackson", "Samaritans of NYC"
City Island Theatre Group is opening their spring season on May 13th with Lend Me a Tenor. Please see the below post for more information. With our opening night scheduled for May 13th the cast and crew have been working very hard to bring you another great memorable night of theater! This night in September 1934 is the biggest in the history of the Cleveland Grand Opera Company—world-famous tenor Tito Morelli is to perform Othello, his greatest role at the gala season-opener. Saunders, the General Manager, hopes this will put Cleveland on the operatic map. When Morelli finally sweeps in it is too late to rehearse with the company and as usual through a hilarious series of mishaps all goes wrong. In true theatrical tradition, the show must go on! With direction by CITG President, Nick Sala, Ken Ludwig’s LEND ME A TENOR features a cast of eight talented performers including CITG favorites Steven Bendler as Max the assistant to Saunders, Camille Kaiser as Julia the opera chairperson, Elizabeth Paldino as Diana the soprano, Susan Rauh as Maggie, Max’s girlfriend and Frank Siciliano as Tito Morelli. Joining them are CITG newcomers Jonathan Abbruzzese as the bellhop, Toni Fazio as Maria, Tito’s wife and Kevin Gordon as Saunders, the General Manager. Don’t miss this uproarious comedy! Performance Dates are: May 13, 14, 19, 20, and 21 @ 8 p.m. & May 15 @ 3:00 p.m.
Labels: "Camille Kaiser", "CITG", "City Island Theater Group", "Comedy", "Elizabeth Paldino", "Frank Siciliano", "Jonathan Abbruzzese", "Ken Ludwig", "Lend Me a Tenor", "Nick Sala", "Susan Rauh"
Here is a great opportunity for our Youth. For any patents that have children who love tennis it sounds like a great opportunity. City Parks Foundation’s Reebok Junior Tennis Academy is celebrating its 25th Anniversary of providing a free, annual scholarship training program for talented New York City junior tennis players. For 25 years, the program has developed youngsters into tournament-caliber players who have earned college scholarships and USTA rankings. By providing free expert coaching, practice time and tournament scholarship, the Academy helps defray the cost of tournament tennis training so that more urban youngsters have an opportunity to realize their full potential. The Academy is currently accepting applicants for this year’s season which will begin with tryouts on Saturday, May 14, 2011 from 3:00 p.m. to 5:00 p.m. at the National Tennis Center in Flushing Meadows Corona Park in Queens. The tryouts are open to all New York City residents, ages eight to sixteen. Applicants will be asked to demonstrate their serve, forehand, backhand, volley and overhead, and are evaluated on their ability relative to their age. Players who pass the first round of the tryouts on Saturday are invited back for the second and final round on Sunday, May 15th. Those who make it through Sunday's evaluations are invited back for an interview and a chance to join the academy. Fifty players will be selected for the full scholarship program, which runs three days a week from the end of June through mid August. To sign up for City Parks Foundation’s Reebok Junior Tennis Academy tryouts on May 14th, players, ages eight to 16, are encouraged to pre-register at www.cityparksfoundation.org/pdfs/cityparks_2011_Tennis_Academy_application.pdf. Applicants may also register in person at the event on May 14th. Founded in 1989, City Parks Foundation (CPF) is the only independent, nonprofit organization to offer park programs throughout the five boroughs of New York City. CPF works in over 750 parks citywide, presenting a broad range of free arts, sports, and education programs, and empowering citizens to support their parks on a local level. CPF’s programs and community building initiatives reach more than 600,000 people each year, contributing to the revitalization of neighborhoods throughout New York City. For more details, please visit www.CityParksFoundation.org. Labels: ", "City Parks Foundation", "Reebok", "Scholarships", "Tennis"
Here is news on a position secured by NYC Councilman Oliver Koppell's daughter, related to gender equality and women's empowerment. Don't women have all the power already? All joking aside, good luck to Carla Koppell in her new position. Carla Koppell, daughter of Council Member Oliver Koppell, has been named Senior Coordinator of the U.S. Agency for International Development (USAID)’s new office of Gender Equality and Women’s Empowerment. USAID is an agency, separate from the State Department, that is responsible for handling the distribution of all U.S. assistance to foreign nations. The purpose of the office is to help bolster the role women play in developing countries. The office will give greater support to female entrepreneurship, scale up initiatives designed to enhance women’s ownership of key assets like land and housing and work to reduce gender gaps in access to new technology and infrastructure. In making the announcement of Carla Koppell’s appointment, Dr. Rajiv Shah, Administrator of USAID, said, “Carla will accelerate our efforts to integrate gender equality as cross-cutting throughout the agency. She will provide our leadership with expert advice and guidance, having most recently served as Director of the Institute for Inclusive Security and the Washington office of the Hunt Alternatives Fund where she worked extensively with women and civil society leaders from conflict areas around the world including Afghanistan, Colombia, Iraq, the Middle East and Sudan. “I am very proud that Carla will play an important role in helping to harness the power, creativity and energy of women and girls to deliver meaningful results for the developing world,” Council Member Koppell said. Labels: ""Carla Koppell", "Councilman Oliver Koppell", "Gender Equality", "U.S. Agency for International Development (USAID)", "Women's Empowerment"
Child care is often a critical factor in allowing a mother to work, especially in low income communities. Maybe the well paid officials making these decisions think low income families should hire nannies? The Executive Budget released this morning is one step forward. However, for those low-income and working families who rely on subsidized child care, there are more questions than answers at this point. There are many concerns about how the child care system will look moving forward. Based on what the Administration has proposed, I am skeptical of whether this is an appropriate solution for our City’s children. More conversations and details are needed to determine how services can remain intact for all 16,500 children slated to lose their day care or child care. . The Mayor seeks to replace $91 million in subsidized childcare services with roughly $40 million for childcare and Out-of-School Time (OST). The shift in funding from subsidized child care to OST - which is meant to provide afterschool programs and services - will still leave many working families scrambling for child care during traditional working hours. Further, it is unclear what the impact will be on existing OST programs, as well as to child care centers, classrooms and providers. I look forward to working with the Administration to find answers to these questions. The Speaker and my Council colleagues will continue to look for suitable, long-term solutions for the subsidized child care system and the best ways for minimizing the impacts of other city wide cuts. Labels: "NYC Councilwoman Annabel Palma", "OTS", "Out-of-School Time", "Subsidized Child Care"
Once again City Island residents have to fight for their basic right to have a fire house on their Island. For those that don't know, City Island has one bridge connecting it to the mainland and a large stock of wood frame homes. One fire when the bridge is congested could ravage the entire island. For more information on the rally please see the post below. Monday afternoon, City Council Member James Vacca, City Council Fire & Criminal Justice Committee Chair Elizabeth Crowley, and Congressman Joseph Crowley will join City Island residents and fire union officials to rally against the potential closure of Ladder Company 53. The Mayor’s Executive Budget, announced today, calls for the elimination of 20 fire companies citywide. FDNY has yet to disclose the specific companies on the chopping block, but Ladder 53 has been slated for closure in the past. If Ladder 53 were to close, first-alarm response times on City Island would double to over 10 minutes, compromising life and limb. WHEN: Monday, May 9, 2011, at 1:30 P.M.
Labels: "Capt. Al. Hagan", "City Island", "Congressman Joseph Crowley", "Councilman James Vacca", "FDNY", "Ladder 53"
Here is an event every mom should enjoy. As stated in the press release tickets are free and 10% of the proceeds will go to our local community based organization, Sustainable South Bronx. Eileen Fisher will be in person with her daughter, highlighting her company's environmentally friendly clothing line, and at the same time, showcasing Sustainable South Bronx' work with underserved urban communities striving to transform themselves into great sustainable places to live. Labels: "Eileen Fisher", "Mother's Day Fashion Show", "Sustainable South Bronx", "Time Warner Inc."
For those who knew Mr. Salvati and want to celebrate in the street unveiling in his honor, please see the post below. Besides his extensive commitment to the community he also served in the U.S Army during WWII. The celebration is set for Monday at 11am at the Intersection of Mickle Avenue and Astor Avenue. Council Member James Vacca will join local community leaders and friends and family members of Louis Salvati on Monday, May 9, at the intersection of Mickle Avenue and Astor Avenue, to unveil an honorary street sign marking “Louis Salvati Way.” The street name honor was approved by the City Council in December 2010 at Vacca’s request to honor Salvati’s decades of community involvement and activism. Salvati, who passed away in August 2010, was a prominent community leader in the Pelham Gardens area. He was an active member of the Chester Civic Association for over 30 years, and served as its President from 1992 to 1997. He also founded the Eastchester Road/Gun Hill Road Business Association, which served to promote the common interests of local business people for over 20 years. Salvati served his country honorably during World War II as a staff sergeant and radioman/gunner for the 320th Bombardment Group of the Unites States Army Air Forces. Labels: "320th Bombardment Group", "Chester Civic Association", "Eastchester Road/Gun Hill Road Business Association", "Louis Salvati Way", "Louis Salvati", "Pelham Gardens"
For anyone with children 6 - 14 years of age interested in acting, musical theatre, dance or "glee"; Riverdale Rising Stars has a summer youth program worth looking into. The flyer sent mentions performance opportunities, trips and fun summer activities. For more information please contact Ben Becher at BBecher@RiverdaleY.org. The main number to the Riverdale YM-YWHA is (718) 548-8200. Their web site is listed below. Labels: "Acting, "Ben Becher", "Broadway on the Hudson", "Dance", "Film", "Riverdale Rising Stars", "Riverdale YM-YWHA", "TV", Musical Theatre"
The following note was sent by Christina Drossakis. She is involved in an organization called “810 Studio”. They are hosting a health fair this Saturday, May 7th. Please do review the post below for more information. Please note they have booth space available. At $10 a both it seems more philanthropic than commercial. I hope it this is only a start for them. Good luck to 810 Studio and everyone involved. Once again all grass roots events for the community will be supported by the BoogieDowner. Studio will be hosting a Health & Homemade Fair. The Fair will take place Saturday, May 7th 2011 from 3pm to 6pm. "810 Studio" is located at 810 Gerard between 157th & 158th Streets.Anyone who is interested in selling goods which fall under health, wellness, community and/or art will be allowed to set up a station in the 810 studio. Each vendor will be charged a flat rate of $10. If the fair is successful we can organize more of them either monthly or seasonally. Labels: "810 Studio", "Christina Drossakis", "Health Fair"
Here is another cinema related success story for the Bronx. "Poetry Man" written and produced by James McCrery has been accepted to the Cannes Film Festival. I embedded a video with James McSherry and Iris Montalvo discussing the film. 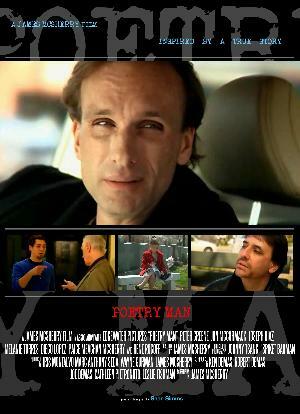 "Poetry Man" runs approximately 26 minutes and will be shown at the 1st ever Bronx Week Film Festival. For those that cannot make Cannes, tickets will be made available on a first come first serve basis on the Olympia Film Locations Inc. web site. When available I will let everyone know right here on the BoogieDowner. Congratulations to James McSherry, Iris Montalvo, Marc Anthony Seda and everyone at Edgewater Productions that made the movie a reality. As an additional note I want to mention that Peter Green is one of the leading actors in the film. Peter Green played the alleged murder in the movie. His IMDB Credits are to long to list, but some of his work includes, Jerry MaGuire, Anger Management, Man on Wire and Frequency. It’s great that major actors like Peter Green believed in the Bronx. I am sure he knew the movie was a winner the second he picked up the script. "Based on a true story, Jimmy, an aspiring writer and Nicky, a neighborhood miscreant suspected of murder, face each other and the truth on the mean streets of the Bronx in this gritty tale of trust and betrayal. 'Poetry Man' is about the redemptive power of art when everything else fails you." 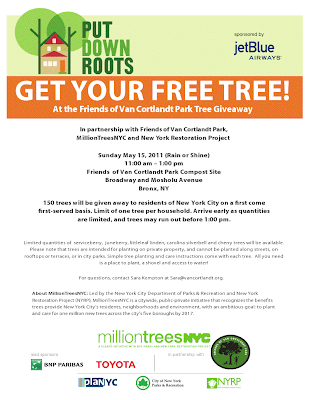 Labels: "Edgewater Film Festival", "Iris Montalvo", "James McSherry", "Peter Green", "Poetry Man", Cannes Film Festival"
Due to popular demand the Friends of Van Cortlandt Park are pleased to offer community members FREE trees to plant on private property. 150 Trees will be given on a first come first serve basis. The event starts at 11am and lasts till 1pm based on the availability of the trees. This event is open to anyone living within the 5 boroughs. Trees cannot be planted in city parks, on terraces or rooftops, or in tree pits on the street. Information about the species of trees available, planting instructions and care will be available. Each person or community group is allowed one tree while supplies last. Meet at the Friends Compost Site- enter the Park at Broadway and Mosholu Avenue. This event is sponsored by MillionTreesNYC, David Rockefeller, Bloomberg Philanthropies and NYRP. Labels: "Bloomberg Philanthropies", "David Rockefeller", "MillionTreesNYC", "NYRP", Jet Blue Airways"
Attached is a Photo with Senator Klein at the New York Botanical Gardens Ribbon Cutting Ceremony for the new Azalea Garden. The ceremony took place last week on April 28th, 2011. Please see the quote by NY Senator Klein below and photo above. The gardens should be beautiful this time of year. "During my time in the New York State Senate, I have championed the preserving of state funding for the Zoos, Botanical Gardens and Aquariums Program that has allowed attractions such as the opening of the azalea garden to continue year after year," said State Senator Jeff Klein (D-Bronx/ Westchester). I am honored to be able to work with the New York Botanical Gardens and have the opportunity to commemorate their 120th anniversary with a resolution adopted by the New York State Senate declaring April 28th New York Botanical Garden Day!" Labels: "Azalea Garden", "New York Botanical Garden Day", "New York Botanical Gardens", "NY State Senator Klein"
Oliver Koppell Hold Press Conference on Mayor Bloomberg's Decision to Reject a Wheelchair Accessible "Taxi of Tomorrow"
Here is some information for anyone interested in attending a rally organized by NYC Councilman Oliver Koppell. From the press release, I think it's a safe assumption to say he is against Bloomberg’s decision to reject a wheelchair accessible "Taxi of Tomorrow". Labels: "Mayor Bloomberg", "Oliver Koppell", "Taxi of Tomorrow"
Here is a collection of professional organizations working together to create the 3rd Annual "Fair at the Square". Enjoy. Professionals of Westchester Sq. Inc.
Bangladesh performance by Bahrati Kemraj. and at tables throughout the Square, with scheduled guided tours. Television, and News 12 - The Bronx. Labels: ", "Dennis Dione Nardone", "Elvis", "Professionals of Westchester Square Inc.", "Ray Raimundi", "Salese and Friends", "Yamilet Mia"
If you love the theatre, especially when associated with the word free, this post is for you. A free-for-all that is free for all! Labels: "Neil Simon's", "Rumors", "The Riverdale Reperatory Company"
Here is another affordable housing success story going up on Brook Ave by 156th Street. The complex includes 1, 2 and 3 bedroom affordable co-ops. The sales prices and maintenance charges are in line with recent co-op sales and should go quickly, especially since the square footage on these co-ops compare with pre-war buildings. I find this very surprising since most "new construction" units do not sport 1,584 sq. feet three bedroom units. One Bedrooms start at $78,894. Three Bedroom units max at $192,750. Maintenance charges range from $660 for 1 bedroom units, up to $1,100 for three bedroom units. Besides the desirable "green" component the complex also sports many amenities. For minimum / maximum income and asset requirements or a copy of their application, please log onto the web address provided below. It looks like a great complex. Please note, their is a June 20th deadline for the application. Via Verde, the winning response to the NHNY Legacy Competition, is now accepting applications for 70 affordable coops. 1, 2, and 3 bedroom apartments are available with prices range from approximately $79,000 to $193,000. Designed by Dattner Architects and Grimshaw and developed by Phipps Houses and Jonathan Rose Companies, the LEED-Gold designed building features 20,000 SF of green roofs, a tree orchard, and building-integrated photovoltaic panels. Informational seminars will be held on May 5, 2011 and June 2, 2011 at 6:30 pm at Lincoln Hospital Center located at 234 East 149th Street, Bronx, NY. Labels: "affordable Co-ops", "Dattner Archictects". "Grishaw", "Jonathan Rose Companies", "LEED-Gold design", "Lincoln Hospital Center", "Phipps Houses", "Via Verde Office"